This page is under development – but here you can see a little from the news and also some reviews. MOST of us take our joints for granted until they play up, by which time significant degenerative changes may already have occurred. Many people are unaware of minor losses in mobility, or may just attribute stiffness, aches and pains to the season or the weather. Osteopath Torben Hersborg has developed a Joint Age Test to assess whether your joints are ageing faster than the rest of you. As most joint problems become worse if not tackled early, take the test to see how you fare. Are you unable to flex all your fingers completely? (10)To obtain your joint age scoreAdd the number of points in brackets after the questions to which you answered YES.Subtract your age from the total number of points – this may leave you with a positive or negative score. Halve this figure. If it is a positive score, add it to your age. If it is a negative score, take it off your age to give you the actual age of your joints.Ideally, your joint age should be the same (or younger) than your actual age. This test is intended to create awareness of your joints, as they are important to look after. It should not be taken as giving an exact age or accurate description of the state of your joints. If in doubt about any part of this test, always consult your GP or an osteopath.Ways to improve joint healthWarm up and cool down properly with gentle stretches before taking part in sport.Keep joints warm in cold weather and do daily stretches. Torben suggests the following: Stretch your fingers out completely and then close your hands to make a fist; roll your shoulder blades; turn your head from side to side and swing your arms from side to side; put hands on hips and then move your hips in large circles; sit on the floor and then hold your kneecaps and then move them in circles.Consume essential fatty acids to lubricate synovial joints and for their anti-inflammatory action. Eat oily fish at least twice a week. Supplements containing olive, flaxseed or omega-3 fish oil supplements are beneficial, as is cod liver oil, which contains additional vitamins A and D important for bone health.Eat at least five servings of fruit and vegetables per day, and consider taking an antioxidant supplement. Vitamin C is both a powerful antioxidant and needed for the production of collagen – a protein found in skin, ligaments, cartilage and other body tissues.Drink at least two litres of fluid per day to maintain good hydration, and a flow of nutrients to the joints.Take glucosamine sulphate, which contains building blocks needed to make synovial fluid (the joint’s oil) more cushioning, and to repair torn cartilage, sprained ligaments or strained tendons.Try Devil’s Claw (Harpagophytum procumbens) and New Zealand green-lipped mussels (Perna canaliculus) – both contain glycoproteins that produce significant reductions in pain and stiffness. IF ANYONE even faintly doubted it, they know it now: Iwan Thomas is a championship racer par excellence. The 24-year-old Welshman yesterday added a Commonwealth 400 metres gold medal to the European and World Cup titles he has won in the space of a month, having overcome a back injury, which, he revealed, had left him unable to walk after his second-round heat on Wednesday. His victory was a blow for his domestic rival Mark Richardson, who had been desperate to make up for his defeat by the Welshman at the European Championships late in July. Just three days after making the 6,000 miles flight from Johannesburg, the World Cup venue, Thomas completed his trial by ordeal with a time of 44.52 sec as Richardson, teeth clenched with effort, followed him home to take silver in 44.60. It was a demonstration of strength and endurance that was hard to credit. But even the rugged Welshman is human – as it became clear following his win. After his second-round heat a disc in his back began to give him such pain that he was unable to walk properly. Twelve hours later he was chatting his way down the final straight with Welsh team-mate Jamie Baulch to qualify from his semi-final in 44.61. Perhaps, he isn’t human after all. Are you a weekend warrior? Do you try to keep fit by playing squash once a week? Or by running round a football pitch on Sunday mornings, then sitting at a desk for the rest of the week? Far from staying mobile and healthy, you could end up achieving precisely the opposite effect. I’ve always tried to keep fit. In my 20s, I played shambolic weekend football. Then I turned to jogging for half an hour every couple of days. Gyms and personal trainers were, I thought, for corporate clones. And why would I see a doctor or a physiotherapist? I wasn’t running a marathon. All I was doing was staying in shape. Then one day, without the slightest warning, both my knees swelled up like balloons. A scan revealed that the slightly idiosyncratic way in which my legs are formed had allowed the combination of exercise and the muscular stress of long hours at my desk to pull my kneecaps out of line. For years, they had been rubbing on the films of cartilage that are supposed to lubricate and protect them, and had eventually worn them out. Joe Simpson, whose catastrophic sporting injury provided the plot for Touching the Void, his bestselling book and film, could have told me what I was in for. “Don’t believe the doctors,” he says, “it’s physiotherapists who are the gods.” After he sheared his tibia and rammed it up through his kneecap falling into a crevasse in the Peruvian Andes, surgeons told him he’d never walk without a limp or climb again. But, after several operations and two years of physiotherapy, he has managed both. In my case, surgery couldn’t help and it took two years of physiotherapy to get me mobile again. Thanks to that – and to taking up yoga – I can now cycle and swim, although running and football are out. Whereas Simpson’s injury was extremely serious, I had damaged myself by combining relatively mild exercise with desk work. How many other weekend warriors have done the same thing? So common is this that he has started importing electrically-powered height adjustable desks from Denmark that allow users to switch between standing and sitting postures as they work, greatly reducing the strain on their muscles and frame…. …The trouble is, I didn’t know I had such a condition until it was too late. If I’d consulted the likes of Hersborg before I’d started exercising, I might have saved myself much pain and trouble. Central London Osteopathy & Sports Injury Clinic (020 7833 5530; www.london-osteopath.com). Regular exercise should give you firmer muscles and boost your immune system. But it can also have a negative effect on your health. We tell you how. Swimming is generally recommended as a good all-round aerobic exercise that relieves the impact on the joints associated with other aerobic activities such as jogging. But swimming incorrectly can increase any problems you do have with your joints, particularly in the back, neck and shoulders. Breaststroke also makes your lower back to sag as it forces the vertebrae to push against one another. For people already suffering from lower back pain, this can be agony after a session in the swimming pool. If you feel your weights are too heavy, or not working your muscles hard enough, this could be down to poor technique rather than the wrong weights. In her latest book, Healing with Magnetic Therapy, Dr Sarah Brewer, Health Journalist of the Year 2002, profiles the many uses of magnetic therapy in treating a broad range of common complaints. These include Arthritis.Menstrual pain.Jet lag.Travel sickness.Tension headaches.Sports injuries.Insomnia.RSI. The foreword is written by Danish-born osteopath Torben Hersborg, therapist to many top athletes, including Modern Pentathletics gold medalist, Dr Stephanie Cook. Office workers who spend hours at their desks are at a greater risk from deadly blood clots than long-distance air travellers, a new study has shown. One in three patients admitted to hospital with signs of deep vein thrombosis had been seated at work for long periods before they became ill.
Just one in 70 had recently travelled on long-haul flights, researchers found. In deep-vein thrombosis – or DVT – a blood clot forms in the deep veins of the legs. It can be fatal if part of the clot breaks off and blocks a blood vessel in the lungs. It has been estimated that more than 60,000 deaths are caused every year in Britain by pulmonary embolisms. The worst affected were IT and call centre workers, the latest study, carried out in New Zealand, showed. It also unearthed evidence of a long hours culture, with some patients reporting they had been seated at their desks for up to 14 hours a day. Dr Beverley Hunt, of thrombosis charity Lifeblood, said the threat to office workers was greater than many realised. ‘It is sensible, if we are sitting for long periods of time, to get up, walk around and start moving our legs,’ she added. Readers have commented on this story so far. Tell us what you think below! THE ANSWER IS TO STAND UP FREQUENTLY, both to reduce the DVT risk and to help your back, which is not designed to sit in one posture the whole day. It is possible to do this WITH AN ELECTRIC DESK, which moves up and down, so you literally sit for 1/2 hour at the time and stand up in between, still able to work in comfort, as the desk moves really high up. I have seen a lot of good results amongst patients of mine, who I have imported these desks for. There are different suppliers, but prices vary a lot. 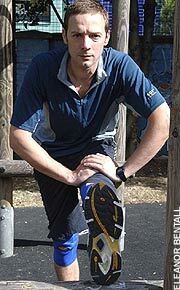 Posted: Fri Sep 28, 2007 7:29 Post subject: Can anyone recommend an osteopath in the Putney Area? Having a few problems with my back, wondered if anyone had used an osteopath from around putney. I go to see Torben Hersborg, who’s based in either Kings Cross or Old Street. He’s well worth the trip. He changed my life, no exaggeration. I could hardly walk let alone cycle a few years ago, after all kinds of treatment. He treats the British Olympic Team, if that helps persuade you?! I work in an office & sit at a desk for a while at a time but I always make sure I take breaks & get up to walk around every half hour or so – its common sense to take breaks really! COME ON PEOPLE USE YOUR NOGGINS!! Outstanding clinic. I have been seeing Torben and Stephanie for 18+ months. Their combined expertise helped me overcome a long-term back/hip issue, and uncovered the source of the problem almost immediately after more than 10 years of seeking treatment elsewhere. On-going treatment with Stephanie has been an absolute game-changer, and has allowed me to get back into weight training pain free. Can not recommend highly enough! "The only man who touches my back (when there are problems) is Torben. He is THE BEST. When I was told my back would take 2 weeks to fix - Torben had me on my feet in 2 days. Just came back from a treatment at Central London Osteopathy this morning... yet AGAIN they've taken me from zero mobility to completely normal... I can't recommend this clinic more....C.L.O. is a life saver! The best clinic in London- I wouldn’t put my trust anywhere else. Whatever back problem you have - it’s always fixed and whenever it’s an emergency they do their best to fit you in ASAP. Excellent service from start to finish.